Someday before today, I received many questions about my posts in the past (here and here). I think both of my posts are clearly to following step by step, but there's a small problem that caused my post can't followed clearly. It's caused by file-hosting which I used (Tusfiles). Because I don't have any choice to use the other file-hosting, so I choose Tusfiles. Beside this file-hosting offer free-service, this also offer a larger capacity than the other file-hosting. Ok, now I will tell you about how to downloading files from Tusfiles correctly. I will make an example from my past post (read here). This tutorial must be using PC, running any OS (Windows, Linux, Mac or another). 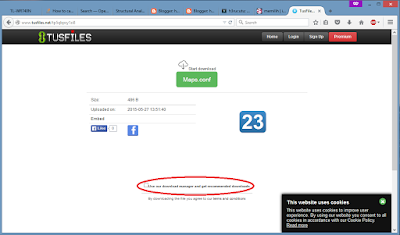 Open your favorite browser, navigate to the download url from Tusfiles for example http://www.tusfiles.net/tp5qbpsy1zi8. Then, uncheck the use our download manager and get recommended downloads. Now you can download the file by pressing the name of file which you want to download (usually have green color button). After you press it, the download progress should started immediately. If there's response from Tusfiles, you can refresh the download url and uncheck again the form which Highlighted with Red Line like in the picture above, then download by pressing the green button which contain the name of the file you want to download. If still there's a problem, feel free to contact me. But what if "Use our download manager" doesn't show up? That's happening with me. How are we supposed to download it then?